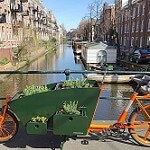 Bakfiets en Meer » Blog Archive » This is Amsterdam and This is My Bike! 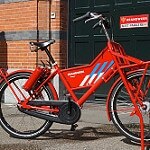 This is Amsterdam and This is My Bike! 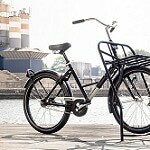 A little bit of bike rap courtesy of the City of Amsterdam who is finally waking up to the fact that bicycles are one of the Netherlands greatest attractions and one of the strongest reasons it’s just such a darn lovely, peaceful place to visit or live. The incredible cycling mode share enables very high population density without the typical urban noise, danger and stress. Much of the 17th and 18th century city remains not as a museum but as a living, breathing, charming city as the city was once defined: a place for people. 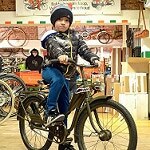 We love riding our bikes here… with our kids, dogs, SO’s, to work, to the pub, to school or just for the sake of riding! 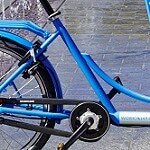 This entry was posted on Thursday, July 8th, 2010 at 13:33	and is filed under Bike Friendly Cities, Bikes in use. You can follow any responses to this entry through the RSS 2.0 feed.You can skip to the end and leave a response. Pinging is currently not allowed. Talking about ‘this is my bike’ I am looking for a foldable (or detachable) box bike with three wheels – I live in New Zealand with a compulsory helmet law for bicycles, but not tricycles, so the three wheels are important (see http://aucklandcyclechic.blogspot.com/2010/06/tricycles-and-cargo-bikes.html). I also live in an apartment with a fairly small lift so the ‘box’ needs to be small and preferably the back bike part would detach or fold. 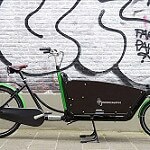 Do you, or anyone reading this comment, have any idea where I might find such a cargo bike or someone who could make me one? Thanks. Firstly, what a ridiculous law, both that helmets are mandatory for cyclists and also that three wheelers are excluded. I hope this is all being fought vigorously. But there is a bike much like you describe. It’s called the Feetz and it’s a lean-steer tadpole trike with a box above the front wheels. It folds up into a sort of large push-cart. Feetz been on the market for a number of years but hasn’t achieved any notable commercial success here in it’s home market. 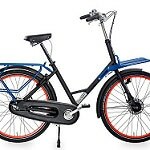 That’s probably because it doesn’t offer the typical cyclist many advantages over a simpler, cheaper, two-wheeled bike with a box on the front. But perhaps it’s exactly what you need to evade the stupid helmet law. I’ve seen and ridden the Feetz. It was a good quality bike that rode quite pleasantly. Actually it rode pretty much like a somewhat slow two-wheeled city bike. Unity might also have a look at Van Raam (www.vanraam.nl), in particular the Victoria/Victor series (sounds like Julie Andrews but isn’t). Don’t fold but 1.5 m isn’t very long. Website is also in English. Don’t know anything about Van Raam other than that they are specialised frame builders. Thanks so much, the Feetz looks absolutely perfect! Not only will it go in my lift and elude the helmet law but it will also go around the supermarket. I will definitely contact the company and, who knows, there might be a completely untapped market in New Zealand for this bike. The helmet law is being fought in both Australia (who have the same law AND higher fines for breaking the law) and NZ but, even though the government knows it has been a disaster, it is political so the subject is avoided and the law is unlikely to be changed. What’s more, many people have been totally brain washed and no longer apply logic, they simply assume that cycling is incredibly dangerous and requires a helmet for those who are mad and brave enough to ride a bike! 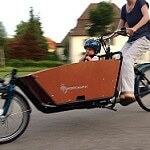 My websites and my cargo bike idea are my small way of changing perceptions – every little bit counts! Though it’s a neat idea and nicely executed this is actually the first convincing application I’ve seen for the Feetz. 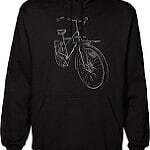 But actually I have a simpler solution: Just add a nonfunctional third wheel to your normal bicycles. 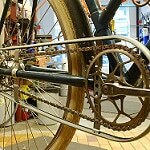 It could be a small wheel to the left of the rear wheel, sprung so that it has no meaningful influence on cycling. 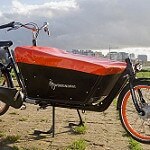 Or it could be a bit useful by adding a little carrier between it and the bike, sidecar style. Hi, I’d like to meet Henry or anybody else in Amsterdam when I come there tomorrow. I only have two days, so I’d love to get in the heart of the biking world and do some recording for our show, Bike Talk Los Angeles. Can someone meet me and show me around? Oops, your comment got caught in the spam filter and now it’s too late. 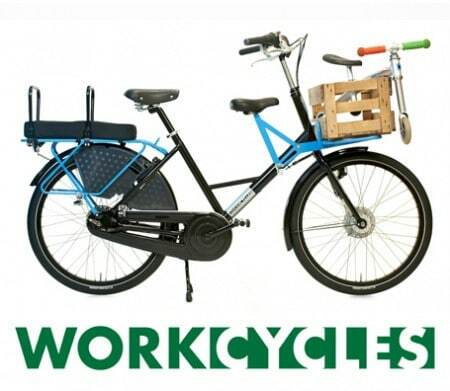 Probably would have been handier to call Workcycles but hope you found somebody to talk to. 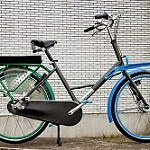 (found it when reading Velouria’s latest Lovely Bicycle blog). @Frits – it’s a thought … but perhaps a bit noisy! 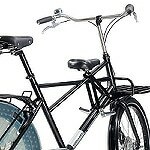 I think it will need to be a full blown tricycle not just a bicycle with a bit bolted on as it could be argued that it is still a bicycle at heart and therefore falls under the ‘bicycle’ helmet law. On another point, do you think that the people at Feetz speak English? Unfortunately I don’t speak Dutch so I sent and email in English but as yet no response. Most Dutch people speak some sort of English so I wouldn’t worry about not being understood. As for immediate response to emails: some people need time to think before they write an answer. I often don’t take that time, and regret it later. The last shot in the video is unfortunate: a lone bicyclist riding between two rows of closely parked cars. 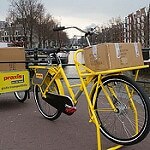 And this in a video purporting to show how much Amsterdam loves bikes.